Summer/ Fall 2013 Newsletter, 26 Years… and Counting! Carrell Group has just released its latest newsletter, for Summer/Fall 2013. Due to such great feedback from prospective clients, we’ve continued to expand the topics covered in each new publication. 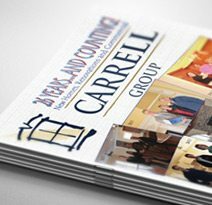 We hope anyone reading our Carrell Group Newsletter will find useful information in one or many of the articles. The articles in our latest edition include many hot topics: Further Price per Sf discussion, new model homes under construction, Crawlspace vs. Slab building, Fixed Cost building in Georgetown County, and another entertaining “Carrell-lina Lifestyle” section. We write and publish this as an informational tool for our customers, so please read it thoroughly and let us know how we can help you.